The City72 Toolkit provides Emergency Management teams with the tools they need to deploy a relatable hub for emergency preparedness that is customized for the community they serve. It provides approachable instructions on how to prepare, such as a visual supply list or easy steps to make an emergency plan. The platform also serves as a source of official information in the event of an emergency. The initial research for the toolkit and platform was conducted by IDEO in collaboration with the City and County of San Francisco. The City72 platform, starting with SF72.org, represents a rethinking of the typical communication around emergency preparedness. SF72 encourages people who would like to be prepared and informed to take simple steps that get them there. The messaging is about connection, not catastrophe. I worked with IDEO to take the SF72 platform and generalize it into the City72 platform that could be deployed and customized by an Emergency Management team in any city or county. Emergency managers are often using computers unable to run a local development environment. This meant we needed to make it easy for them to deploy without installing any new software on their computer. We wanted to guide emergency managers in the customization process in order to keep the voice of the platform consistent and relatable. Emergency managers needed easy-to-follow, step-by-step instructions for some of the more technical aspects of customizing their City72 site (e.g., setting up the Google Crisis Map). In response to the difficulty we observed with deployment, I searched and asked around about a possible way to directly connect the code repository to a Heroku app. At first, I found a few promising leads but nothing panned out. Then I got a response from Heroku—they were developing something that would do exactly this! We were delighted for the City72 platform to serve as the initial case study for the Heroku button—a one-click deployment process that skips setting up a local development environment. The content management system (CMS) that is used to customize the site is designed to map intuitively page by page to the content of the site. Each customization step is accompanied by tips or step-by-step directions. This system lets the team easily change the branding, photography, content, map, and Twitter feeds that their viewers will see, making the site into a valuable local resource. 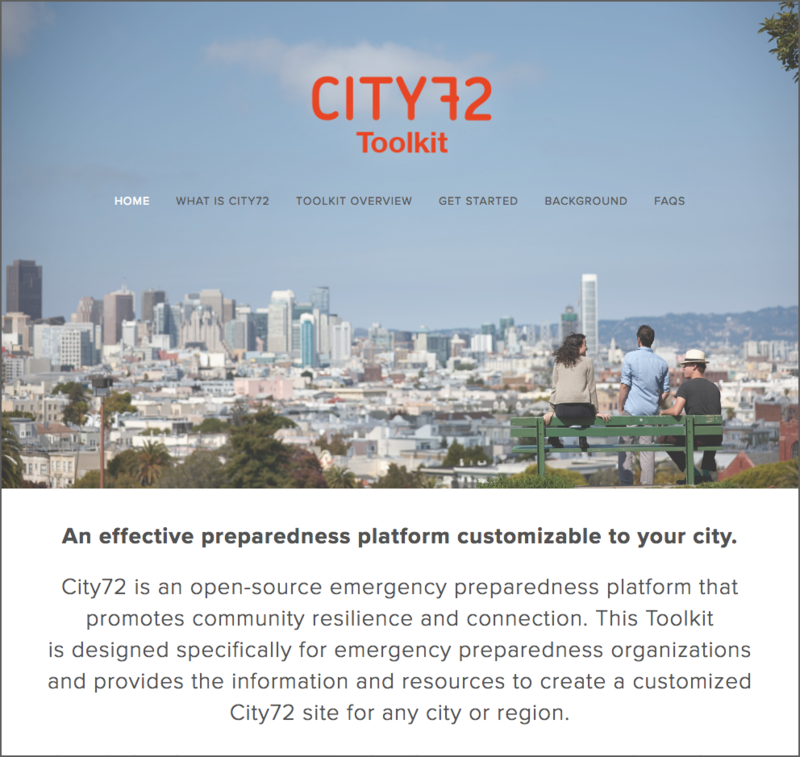 Emergency Management teams can learn about the platform via the City72 Toolkit website. This site gives them everything they need to understand the aim of the initiative, the research behind it, the steps to deploy, and how to customize their own site. The City72 Toolkit is the result of a large collaborative effort involving researchers, resiliency experts, emergency managers, designers, writers, photographers, videographers and developers. I was honored to make a contribution alongside so many talented and passionate people. Given the constraints of a tight deadline, I chose to rely heavily on existing frameworks and keep the interaction very simple. This enabled us to release a working platform on time, without going over budget. In the interest of keeping things simple and intuitive, I organized the CMS to mirror the site page for page. I also left room for tips and instructions that were edited by our writer. I created all of the designs and user stories needed for a steady path to our first release. I also verified stories, kept priorities in order, and led the daily standup meeting with the development team. I adapted the design or the scope as needed to stay on target for launch. As the development progressed, I checked progress by syncing the code via Github and testing it locally. I would often find bugs, and if they were easy enough for me to fix myself (e.g., typos), I would make the fix and check it into our repository. A guide to deploying and basic customization of the site. Detailed instructions for customizing and embedding a Google Crisis map (several steps, broken down into satisfying sections). 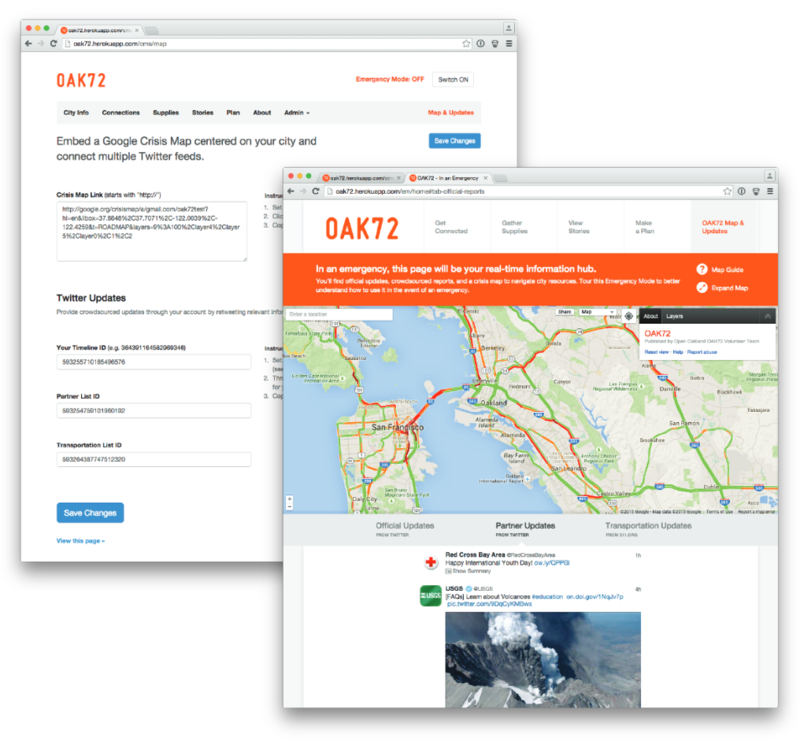 A step-by-step guide to aggregating Twitter feeds into an embeddable widget. Additionally, I verified that all of the instructions on the toolkit worked, and I gathered feedback from emergency managers who used it to deploy a City72 site. I established the public GitHub repository along with an organized set of open issues, planned features, and the detailed readme. When users report issues or request features, I’m usually the one to respond. I love being part of an open source project and being able to contribute in a productive way as a designer. I led research sessions both before and after the launch of the open source platform, which were the inspiration for improvements to the user experience. No matter how finished or simple a project seems, there is always something valuable to be taken away from user research. I have worked with Emergency Management teams all over the country to deploy the toolkit for cities and counties. 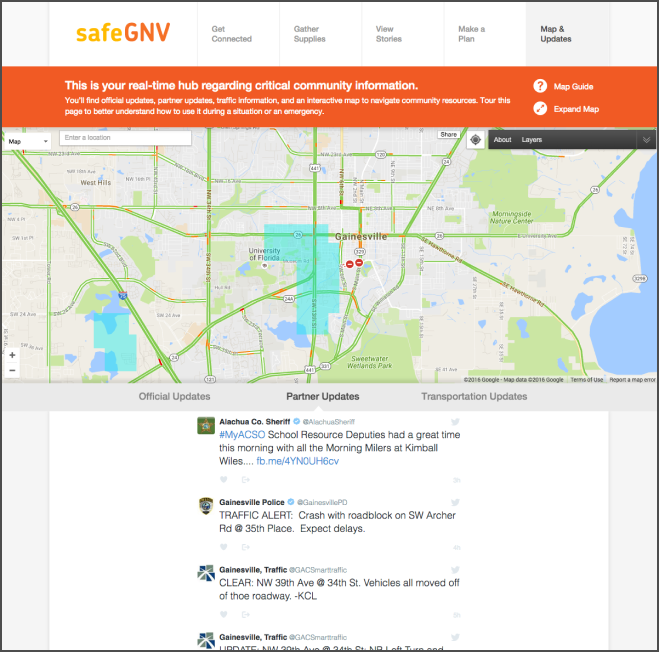 More recently, I worked with the City of Gainesville, Florida, to customize the platform and help with launch logistics. We updated some of the front end functionality and designs, then launched SafeGNV.org. If you know of a city, county or organization that would benefit from an emergency preparedness hub, please encourage them to learn more at toolkit.sf72.org.